Be the first to share your favorite memory, photo or story of Verlie. This memorial page is dedicated for family, friends and future generations to celebrate the life of their loved one. 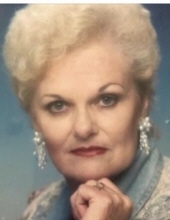 Verlie Celeste Gates, age 76, of Douglasville, passed away on March 25, 2019. She was born in Atlanta, Georgia on April 24, 1942, daughter of the late Charles Wolfe and the late Boise Fern Shipp Carroll. She retired from Wellstar Cobb Hospital after 30 years of service. She enjoyed shopping, cooking, gardening, and decorating her home. She also loved spending time with her children to whom she was deeply devoted. She loved to laugh and to make others laugh. Verlie is survived by her husband of 60 years, Billy E Gates; four children: sons, Brian Gates and spouse (Lisa), Mark Gates and spouse (Julie); and daughters, Darlene Davis and Rene Priest. In addition to her parents, she was preceded in death by her brothers: Joe Sorrells, Jack Sorrells, and Bobby Sorrells. She had 11 grandchildren, and 7 great grandchildren. To send flowers or a remembrance gift to the family of Verlie Celeste Gates, please visit our Tribute Store. "Email Address" would like to share the life celebration of Verlie Celeste Gates. Click on the "link" to go to share a favorite memory or leave a condolence message for the family.